The ambitious objective, stated already on the book’s cover, is to offer the reader a portrait of the “Other Francis,” namely, to tell all that has never been said about Pope Francis. Not an easy task, given the impressive amount of volumes dedicated to Francis, which already crowd the shelves of bookstores. The author is the American journalist – but transplanted to Rome – Deborah Castellano Lubov, Vaticanista of Zenit. “The Other Francis,” (‘L’Altro Francesco’) (published in Italian by the prestigious publishing house Cantagalli of Siena, but which soon will be translated into English) contains a preface by the Vatican Secretary of State, Cardinal Pietro Parolin, and 14 interviews with personalities of the Roman Curia (and of the Church), spread throughout the five continents, and relatives and friends of the Argentine Pontiff. However, not lacking in these 200 pages is interesting original news, information, revelations, and sometimes even courageous opinions about the Argentine Pope and various timely questions raised by him. Jorge Mario Bergoglio is a simple and friendly man, who likes to joke a lot, but who is also the Pope who has been able to focus the attention of all humanity on the topics most dear to him: human dignity, unbridled globalization, the distribution of wealth, the safeguarding of Creation. Who is “The Other Francis” (L’Altro Francesco) to which you make reference in the title? A man that first of all wants to be considered and treated as a “normal” person, even if now, Cardinal Koch told me, it disappoints him that he can no longer easily agree to meet Ecumenical Patriarch Bartholomew at a bar in Rome’s Piazza Navona to have a cappucchino together. From your many interviews, one would say he is a very friendly man with quite a sense of humor . . . Indeed! Cardinal Dolan of New York also bore the brunt of it, because, as he told me, he is a ‘man of girth.’ Yet, he told me: “But thus, I feel immediately at ease with him,” he told me. Cardinal Dolan’s interview shares quite a few fun, heartwarming anecdotes with Francis, especially from when the Pontiff visited New York in September of 2015. How was the idea to write this book born? The beginning of the Bergoglio pontificate coincided, more or less, with the beginning of my activity as Vatican correspondent of Zenit. Francis attracted much attention immediately, because of all the novelties brought within and outside the Church. In this atmosphere of great excitement, for journalists used to following the Vatican’s news, I often felt the need to confront truly expert voices. Thus, many interviews came about, day after day, in doing my work, and even many friendships. Then I wondered if they would be able to share with me an unfiltered account of their view of and relationship with Francis. This is the result. In regard to interviews, Francis has granted many more than any other predecessor. Did you discover anything particularly interesting about these? Much has been said and written about the relationship between Francis and Benedict, often also with much superficiality, inventing oppositions … is it true? Suffice it to say what Francis’ sister said, hence a privileged source of news, said to the journalist and my friend Michael Hesemann (German author and historian, co-author of My Brother the Pope co-authored with Georg Ratzinger), whom I thank for having allowed me to include his precious interview in my book. “You owe me obedience. If you are elected, you must accept,” said Pope Ratzinger to Cardinal Bergoglio, when they met the last time before the Conclave. And what other interesting thing did you discover on the pre-pontificate biography of Pope Bergoglio? Who is Adrian Pallarols, the Pope’s other friend who you interviewed? Adrian is a famous Buenos Aires silversmith, a very dear friend of the Pope. I don’t want to ruin the surprise for the reader. I will tell you only that it was Bergoglio himself to celebrate his marriage and baptized his children. The problem with the wedding was that the parish priest, who held the course that Adrian and his wife had, was very abrupt with all. When Bergoglio called him, introducing himself as “Father Jorge,” to come to an agreement about the celebration of Adrian’s marriage, he began as usual to shout and vehemently protest, until he discovered that . . . you read the rest. Returning to the topic of the relationship between Francis and the mass media in general, what did you learn? Archbishop Gaenswein’s judgment seems important to me: the media were never so well disposed with Pope Benedict as they are today with Pope Francis. 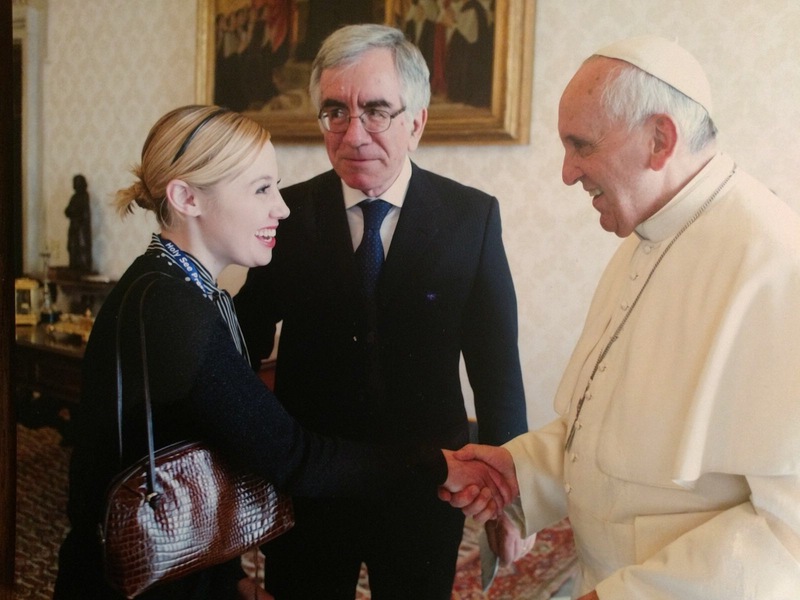 Even if Francis — I learned from the former director of the Vatican Press Office, Father Lombardi –, that Pope Francis doesn’t always appreciate journalists’ questions during air travel. Instead, he is often rather disappointed, because he doesn’t find them interesting, or because journalists ask anything that passes through their mind instead of focusing on the contents or the most significant episodes of every trip. It is said that the ‘normality,” the sobriety of Francis, who for instance lives in a very small space compared to the large apartments of some cardinals, brought much disarray in the Vatican. This is true in part, but it’s not even necessary to emphasize it. When I went to interview Cardinal Turkson in his office in his dicastery, we spoke about the greatness of the rooms: He also expressed that similarly, his residence, is large and one of his architect friends once said that in that surface a good four rooms could be made, but certainly not in a building as ancient a structure as that one. And in any case, do you know where Cardinal Turkson went to furnish his house when he arrived in Rome? IKEA! Francis made everyone understand thoroughly that he cannot endure adulators. He wants everyone to tell him exactly what he thinks. And then, among all the judgments and opinions expressed by various Cardinals and Bishops, is there someone that surprised you for his frankness? Returning to interviews on a plane, there comes to mind the Patriarch Emeritus of Jerusalem of the Latins, His Beatitude Fouad Twal. On the return flight from Poland, in July 2016, there was talk of terrorism and Islam. It’s true, he told me, that the head of the Catholic Church can’t say explicitly everything about Islam. However, according to him, it was surprising to hear the Pope explain that violence exists in all the religions, including Catholicism, and that one religion alone can’t be accused, or Cardinal Napier of Durban, South Africa, on the post-synodal Apostolic Exhortation Amoris Laetita. How can the African Church go about not losing her credibility? — he wondered. Now, in fact, the Church must tell Africans that she was mistaken 200 years ago, preaching that to become Christians they must abandon customs such as polygamy; because today one can go to Communion even if one has more than one wife, because one cannot turn one’s back on them. On the list of interviewees there are also personalities of the Church considered not very in tune with Pope Francis. Why did you want to include these voices also in the book? I believe that a variety of opinions and points of view is a merit, not a defect, for a book of this nature. Therefore, there is also, for instance, Cardinal Muller, who became “former” Prefect of the Congregation for the Doctrine of the Faith precisely while the book was going to press; a man who is certainly very different from Francis in provenance, orientations, mentality. Therefore, it has all the more of an effect to hear him say what is the strongest impression Francis makes on him: It is when he embraces men and women even with a deformed face from a serious sickness, without that aversion that would be simply natural. Cardinal Muller also admits that it is certainly easy to preach love of neighbor, but difficult to practice it. Then there is also Cardinal Charles Maung Bo, Archbishop of Yangon, in Myanmar, certainly a country “of the periphery” for the Catholic Church, but Francis in fact decided to honor it undertaking an Apostolic Trip there? Not “periphery” but “periphery of peripheries,” Cardinal Bo corrected me! It’s a Church that has suffered so much, in 60 years of “inhuman” dictatorship, as he himself described it. No contact with the rest of the world, the foreign missionaries expelled overnight . . . Not only “periphery,” “but a country forgotten by the world,” he said, noting the only exception was now by the Church and now by Francis.